Editor's note: As of Feb. 2015, due to the Alaskan Way tunnel project, some of the shops on the waterfront with pressed-penny machines are currrently closed, so it's not an optimal time to do a hunt. Check back. If you are like many Seattle-area parents, you’ve been to Seattle's downtown waterfront. You’ve seen the sights and explored the tourist shops. Here's a different way to explore those old (and new) haunts, a way that thoroughly engages kids: a pressed-penny scavenger hunt. What are pressed pennies? They go by several names: smashed pennies, elongated pennies, flattened pennies. Insert a penny and two quarters into a pressed-penny machine, turn the crank and out pops your penny, stretched and stamped with a picture. The images can be simple or intricate, but they are all a work of art. 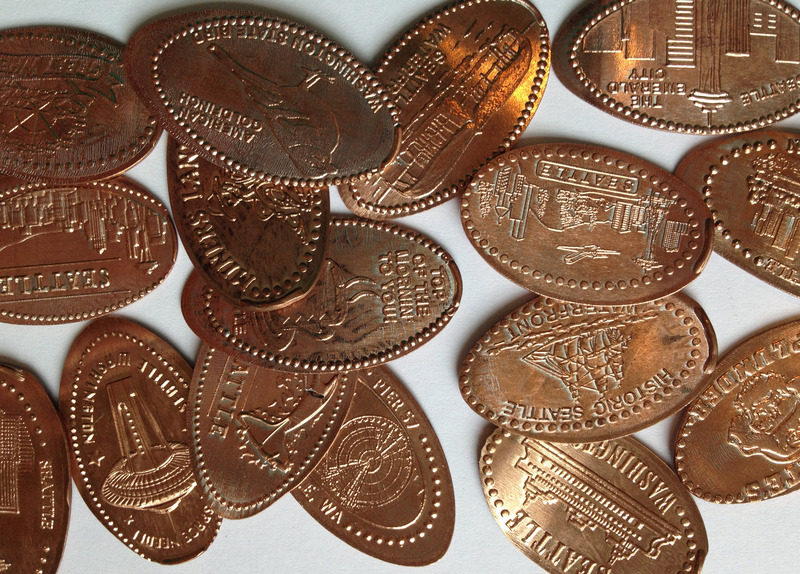 Other than a memory, pressed pennies are the cheapest souvenirs you can find. 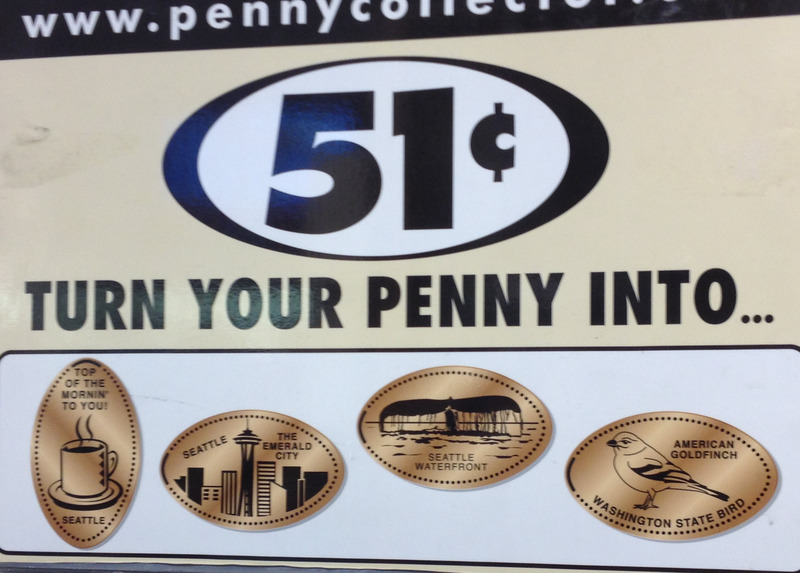 The Seattle waterfront has several pressed-penny machines scattered among the tourist attractions. They are easy enough to find that small children will enjoy the search, but the thrill of the hunt is still exciting for older kids. You can make your visit an hour or a day by checking out other attractions along the way. And when you are done, you’ll have a handful of pressed-penny treasures to take home! Your pennies don’t have to be pristine, but they will look better if they are clean, and cleaning them can be fun. All you need is a glass dish with a quarter-cup of white vinegar and half a teaspoon of salt. Drop the pennies in, swirl them around for ten seconds, then rinse thoroughly with water and dry them on paper towels. The vinegar is an acid that eats away at the tarnish. Make sure you rinse the vinegar completely, otherwise the penny might turn green! Each pressed penny costs 50 cents, plus the penny. Make sure you have two quarters on hand for every penny you plan to press. Not every shop owner appreciates opening up the till to make change. There are at least six machines in waterfront tourist shops and attractions. Follow these clues and you will find each one. Find Ye Olde Curiosity Shoppe. Hidden among the wonders and mysteries of this little store, you will find two machines for pressing pennies. You will also find fortune-telling machines, old-fashioned movie machines and music players galore, so bring some extra coins. The Seattle Shirt Company has a machine waiting for you tucked away among the T-shirts. Get your pennies ready and press away. The Happy Salmon tourist shop has more than just postcards — there’s a penny press here. Finding this machine is easy; it’s right outside the door. Pirate’s Plunder Gift Shop has treasure for you. There’s a machine for pressing pennies here, too, matey. You’ll have to find it hidden in the postcards and trinkets, but you’ll be happy you did. - Seattle Waterfront Carousel and Arcade. 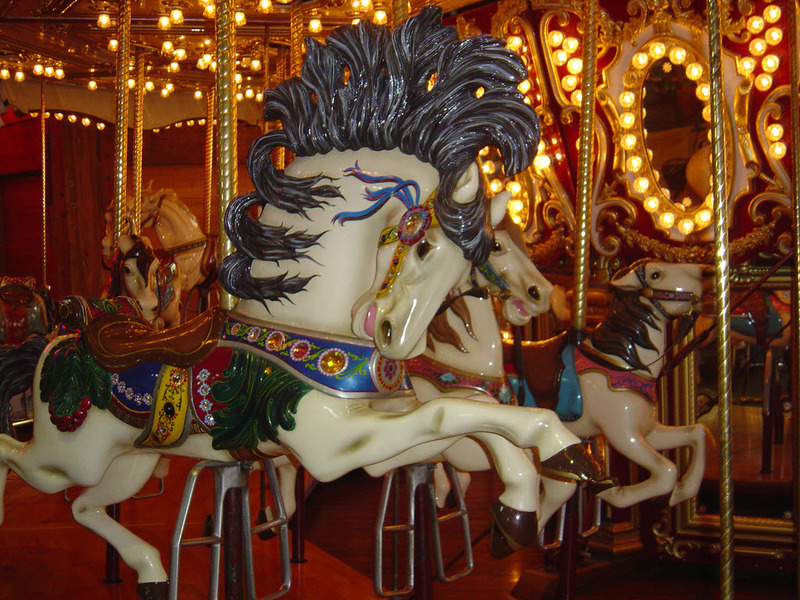 Nestled at the end of Pier 57 is a beautiful indoor carousel with old-fashioned horses. Take a ride then spend the rest of your quarters in the arcade-style games that surround it. - Seattle Great Wheel. Although the ride is not cheap ($13 for adults and $8.50 for kids, children ages 3 and under free), the view of the city from the top of this 10-minute ride is spectacular. - Ivar’s Fish Bar. 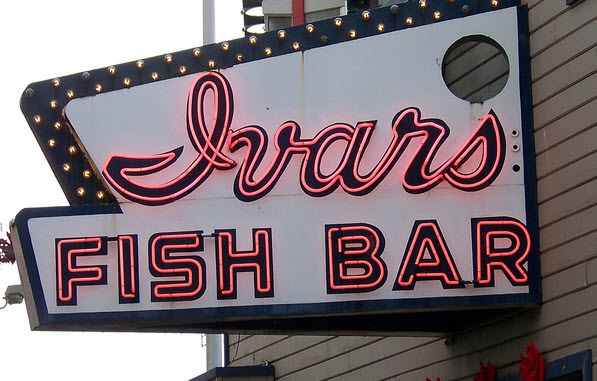 On Pier 54, Ivar’s Fish Bar has been a Seattle tradition since 1938. Stop in for a quick bite of fish and chips. - Piano in the Park: Through Aug. 17, Pier 62/63 will host an art piano (which anyone can play) as part of this nifty new art/parks/culture program. - M&M Minis come in plastic tubes that are the perfect size for storing quarters. Stack sets of two quarters and a penny in the container and you will be ready for every pressed-penny machine you find. One tube will store about 40 quarters and 20 pennies stacked together. - You can buy a pressed-penny book with slots for storing and displaying your treasures. Some are available at Ye Olde Curiosity Shoppe on Pier 54. - Each machine has more than one design to choose from. It is up to you how many you press. If you decide to press every possible penny available on the waterfront, you will need 25 pennies and 50 quarters. Lexie Tigre was born and raised in Seattle. 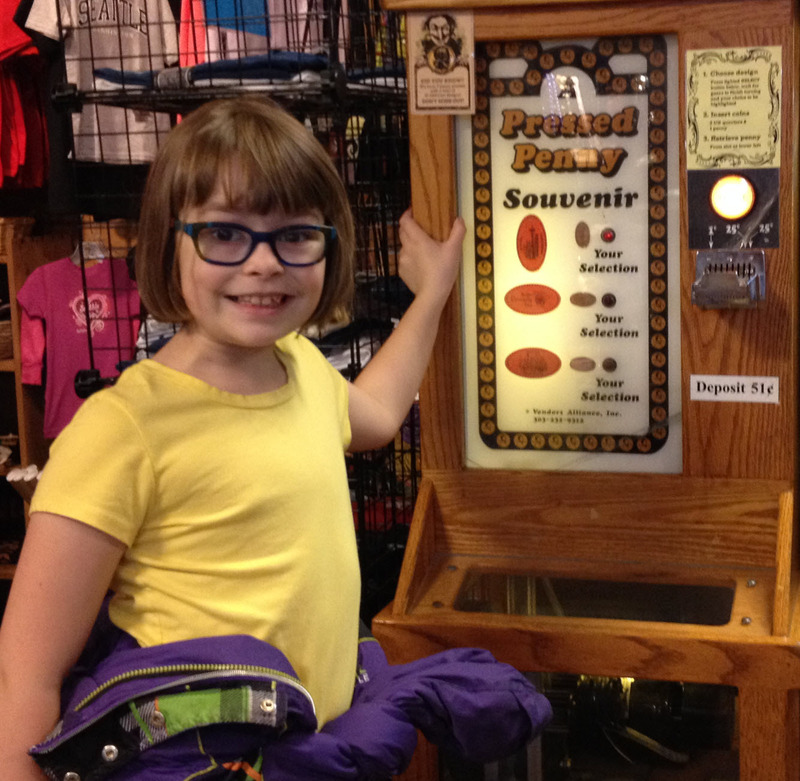 She and her daughter have a growing pressed-penny collection and they get a little too excited when they see a pressed-penny machine!